I needed lots of pine trees for a lumber camp scene I was building in one corner of my former HO Utopia Northern Railroad layout. 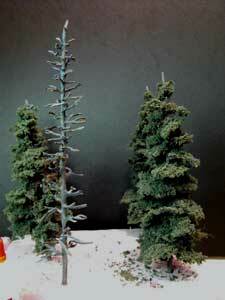 I had a Woodland Scenics TK-23 kit that makes five pine trees 6 to 9 inches tall. The kits use white metal trunks that can be twisted in a spiral to the shape that is pleasing to your eye. A sheet of Woodland Scenics stretchable foliage is included. This is cut into irregular pieces about 1 inch across. It is necessary to tease the pieces apart until they are somewhat lacey in appearance. All that's needed for tools is a good white glue (I used Weldbond), a pair of scissors, and some paint. I hand-painted the trunks first with a mixture of Polly Scale E/L Gray and Engine Black. I mixed in enough black to make the gray darker. I didn't measure the proportions. Next I dry-brushed on some DecorArt burnt sienna and followed that with a few dabs of raw sienna. Finally I added some lighter highlights with Polly Scale Lettering Gray. They are all flat paints. Avoid shiny enamels. I tried to make sure I hadn't left any glaring metal showing. The foliage will cover most mistakes. A few of the branches broke, but you don't need them all anyway. Woodland Scenics even mentions leaving some of them without foliage. Here's the glue and foliage sheet. I planted the trunks in a block of styrofoam. This made it easy to rotate the trees to add the foliage to the branches. 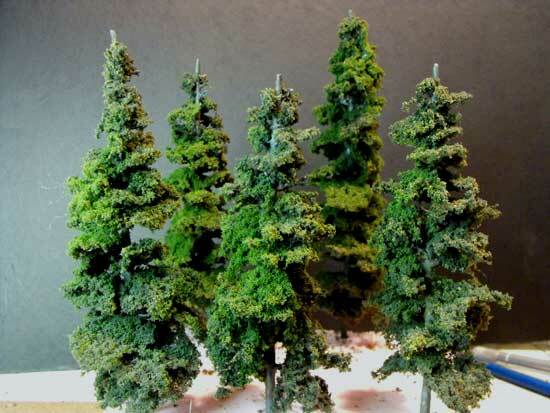 The final step was to spray the pine tree kits with hair spray. This helped to hold the shape of the trees. While wet, I sprinkled on fine green turf and a fine brownish turf. Both were by Woodland Scenics. 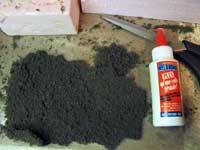 Woodland Scenics has an extensive line of colours and textures. Below is a photo of the completed trees. It's best to plant trees in an odd number grouping. 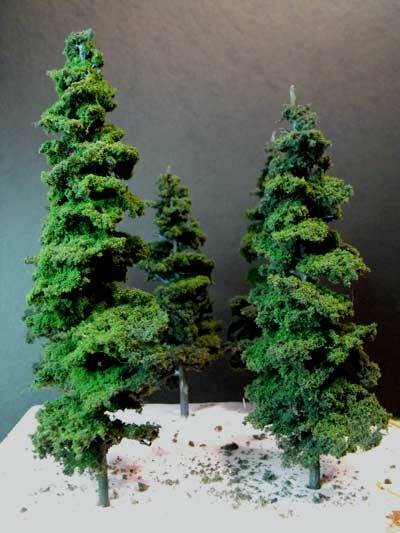 If you're looking for pine tree kits for foreground trees, kit TK-23 is a good starting point. The kits aren't difficult and the results are excellent. 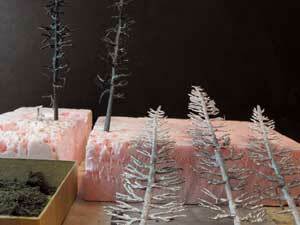 Go from "pine-tree-kits" to making air fern pine trees. 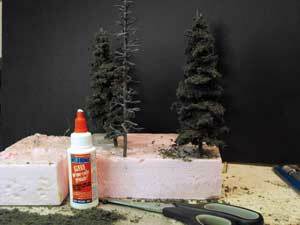 Return from "pine-tree-kits" to my scenery page. Return from "pine-tree-kits" to my Home Page.